WE PRIDE OURSELVES on responsiveness and rapid turnaround. Established in 1993, EditPros is a compact business enterprise that achieves efficiency through personal service. When your scheduled work hits our desk, it's given top priority — not just by an individual, but by a team: EditPros partners Marti Childs and Jeff March. We've worked together since 1985, and we've learned how creativity is enhanced through collaboration. We'll save you time by saving steps. Our strength is derived from our training in journalistic research and reporting techniques. That, combined with our experience in developing marketing and advertising materials, helps us quickly gain understanding of the needs of individual clients. When you add to that our fluency in digital publishing technology and editorial management, you'll find you can get a great deal done with one phone call to EditPros. Marti Smiley Childs has been involved in public relations, publication management, graphic design, writing and editing since 1982, and previously devoted several years to computer system operation and quality control. 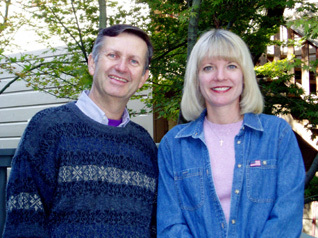 Marti, along with Jeff, is the co-author of five books. She prepares EditPros book manuscripts and clients' projects for publication. At the University of California, Davis, Marti edited and wrote for periodicals encompassing widely divergent academic disciplines in the humanities and social sciences, as well as in biotechnology, agricultural and medical research programs. Jeff March has more than 30 years of experience in publication writing and editing, broadcasting, and advertising copywriting and management. Before a decade in management at UC Davis, Jeff helped launch pioneering Sacramento business magazine Executive Place, of which he was editor; directed marketing communications for electronics manufacturer ESS Inc.; was broadcast advertising coordinator and catalog writing specialist for Weinstock's and The Broadway department store chains; and spent several years in commercial broadcasting with KROY Sacramento, KIEV Glendale (Los Angeles) and other California radio stations. We invite you to view the LinkedIn profiles of Jeff March and Marti Childs. Learn how EditPros can help you save money… time… and face. The EditPros office is in the university town of Davis, California. Normally we write about our clients, but many of them have written “thank you” notes to EditPros. Our clients over the years have spanned a broad range of fields. Earn a reward for recommending us.